Originally published by "The Yorkshire Gazette" (Gazette and Herald Newspaper) on CD Rom. Delivered FREE anywhere in the world direct from the supplier. The Year Book section contains a list of the Heads of Households for each (numbered) house in each street in the city of York for 1936. 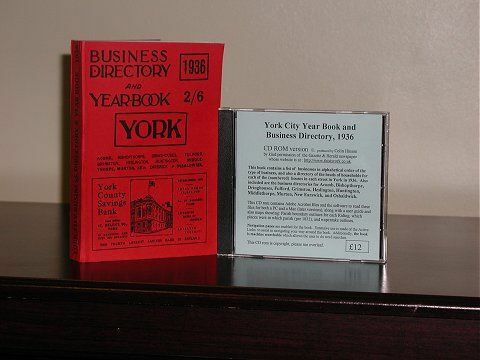 The Business Directory contains a list of businesses for the City of York, in alphabetical order of the type of business, for 1936. Also included are the business directories for Acomb, Bishopthorpe, Dringhouses, Fulford, Grimston, Heslington, Huntington, Middlethorpe, Murton, New Earswick, and Osbaldwick. Page Hospitals, Asylums Charities, etc. "As a family historian always searching further and further back through history, this CD made me sit up when I came across my grandfather's name who I remember as if only yesterday. Crammed full with names and addresses this is a joy to read. The pages have been scanned to a high quality and navigating is so simple that even my husband was drawn to reading it which sparked off ramblings down his own 'memory lane'. I thoroughly recommend you read this should you be researching in the City of York (and outlying villages) not only to give you a better insight into your parents/grandparents era it also has useful lists of many people, for instance all the names of the City of York Lord Mayors and Sheriffs for the previous 100 years are included. I for one will be forever dipping back into this fascinating 'only yesterday' Directory. 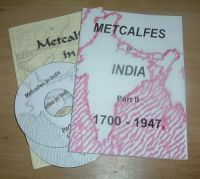 A CD of interest for both the younger and older generations alike"
Note: There are no mentions of 'Metcalfe' in the index.